I have a story for almost every store in which Asulia finds a home. More often than not, I have shopped there and have fond memories of what I bought the last time I was there. I love getting to know the people who run the store. Volante Farms, our newest store as of today, is a perfect example. When Chef Todd found us on social media and reached out I was thrilled. I’ve known about the great work he and his team are doing out in Needham for a while. When we sat down to talk, we both agreed that you can taste the care and craft that goes into products made with heart. I have a huge crush on the vegetables at Volante Farms. They are beautiful! I know I might sound crazy, but the vibrant colors and textures make me swoon. I just want to grab a bunch of veggies and head to the kitchen to dice, chop, and cook for friends and family. Just about everything at Volante is local. They grow a majority of their own produce. They’re family run. They support local makers in our New England economy. We are lucky to have friends like them. Thank you Volante Farms for believing in our product and mission. Everyone I’ve met is a joy to work with. We couldn’t be more thrilled to see our dumplings on the shelf at Volante starting today. 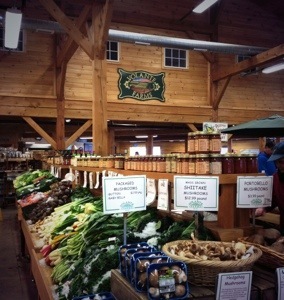 Head out to Volante Farms in Needham, MA and shop local!